The bifold wallet is classic and elegant, perfect for daily use. It is easy for carrying. Its large capacity makes the life convenient. Multi colors and simplism style looked more elegant and easy to match. It's great for everyday wear as well as special occasions. Comfortably holds your credit cards / ID card / bills / coins,very convenient and practical. Well organizer. ★ Slim and lightweight.Thin and comfortable to carry in the coat pocket. ★ Plenty of room in this wallet to easily hold all your essentials.Even loaded it up, this wallet will still keep flat and slim. ★ Double snap closure and top metal zipper buckle closure. ★ Shiny gold-color zipper and tassel accessories,stylish luxury appearance. Every Lady will be happy to have this stylish wallet!!!! ★High Quality Material - Top quality PU leather with elegant and beautiful double button closure style,safe and easy to use. 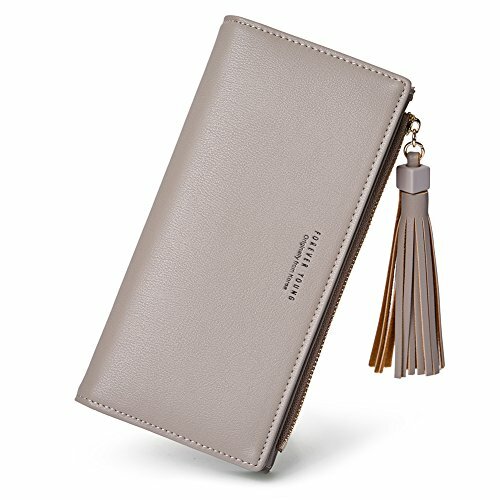 ★Function and Slim Design - This women wallet has 8 credit card slots, 3 note compartment(cash/checkbook), 1 zipper coin pocket and 2 photo holder. Comfortably holds your credit cards / ID card / bills / coins,very convenient and practical. Well organizer. ★Perfect Size - 7.56" X 3.74" X 0.79". Weight: 0.32 lb.Slim and Thin. Perfect to hold in your hands or put into your bags. ★Well Designed - Double snap closure and top metal zipper buckle closure. Shiny gold-color zipper and tassel accessories,stylish luxury appearance. ★ A HAPPY PURCHASE GUARANEED - If you aren't completely happy with our women wallet,please contact us by E-mail; we'll do everything to help you: refund or a replacement, whichever you prefer.